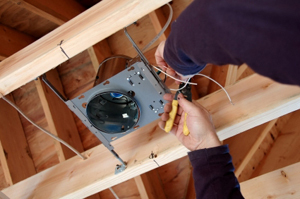 New Home Wiring – Kaplan Electric specializes in custom new home wiring. 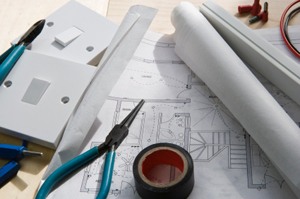 This is not a sideline for us; we can help you plan and design your complete wiring system. To see how we can complete the project to your exact specifications, visit our Custom Design Page. New Commercial Projects – Kaplan Electric is a bonded, full service, commercial, electrical company with many large projects under our belt. We can work with owners or contractors to plan, design, bid, and complete any projects you may need done. Please visit our Custom Design page. Old Work, Rewiring – We have expert technicians to rewire your old knob and tube homes, add smoke detectors, fish hard-to-reach areas and upgrade your service entrance. Generator Installations – Need backup power? We can install either manual generator transfer switches that you plug into your portable generator, or fully automatic transfer switches complete with a variety of Kohler generator choices. Smoke Detection, Carbon Monoxide, Heat – Add to your existing detection system or install a new system, in existing homes and new construction. Telephone, Television Jacks – We can add to an existing system or wire a new system. Aerial Bucket Work – We have a 42’ work rated boom truck, for your aerial needs. We can service your existing parking lot pole lights or install new ones. Service Technician – We have a full time service manager to handle all small project needs you may have, from changing a fuse to adding that new air conditioner outlet. This is not a sideline business. Our service technician will return your call and schedule an appointment. Commercial, Industrial Maintenance – Are you tired of unreliable service technicians? Give us a call and our service technician will put your business first and keep your business going.